This photograph shows the Atchison, Topeka and Santa Fe Railway Company depot and the Fred Harvey Bisonte Hotel in Hutchinson, Kansas. The two-story red brick building designed by architect J.G. Holland features a gable roof and a veranda style porch. 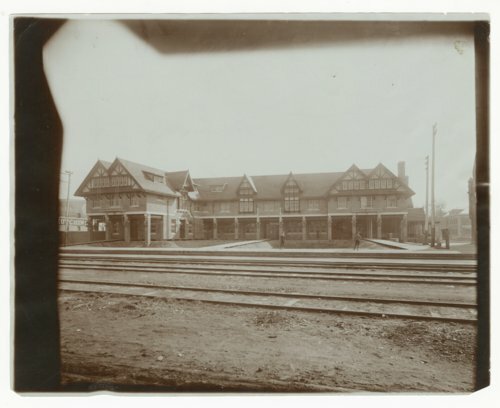 The facility opened in November 1897 and provided accommodations for a number of years until closing its doors in the late 1940s due to the decline in rail services. The building was razed between 1964 and 1965.